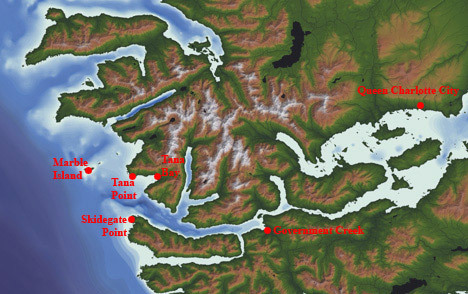 The west coast of Haida Gwaii/Queen Charlotte Islands teems with marine life as small as plankton and as big as whales. Sea birds - tufted puffins, marbled murrelets - sea lions, orcas, minke whales, humpback whales, kelp forests, rugged cliffs - awaiting to quench thirsty eyes! On shore, everyday life unfolds in a myriad of ecosystems - ancient rainforests, kaleidoscopic intertidal life, beaches in remote nook and crannies. Explore this ecological paradise with local marine biologists! Depending on what you like to see and do - and weather permitting - we offer a range of potential hikes and beach explorations. © 2003 MTE Inc.. Send site related questions and comments to the webmaster.